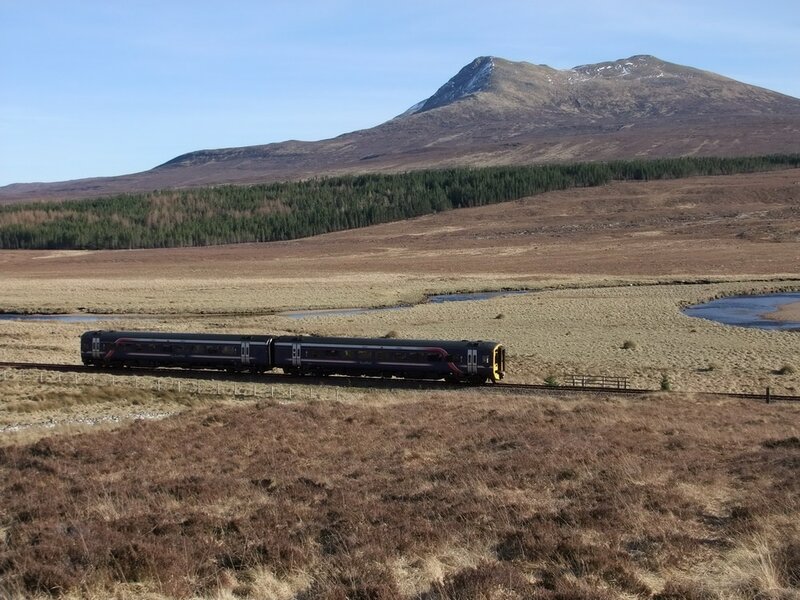 Banner photo: Slioch left and Beinn nan Ramh right. 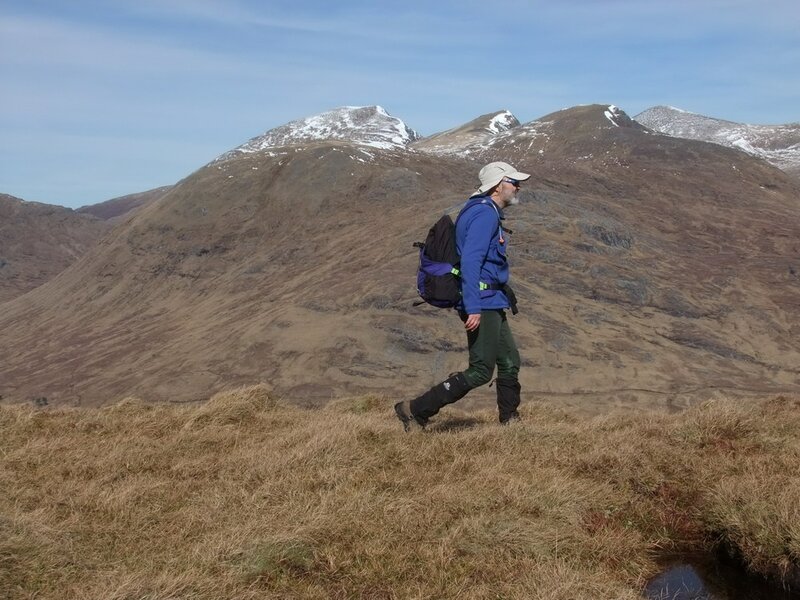 The route up Beinn nan Ramh followed the right hand skyline. 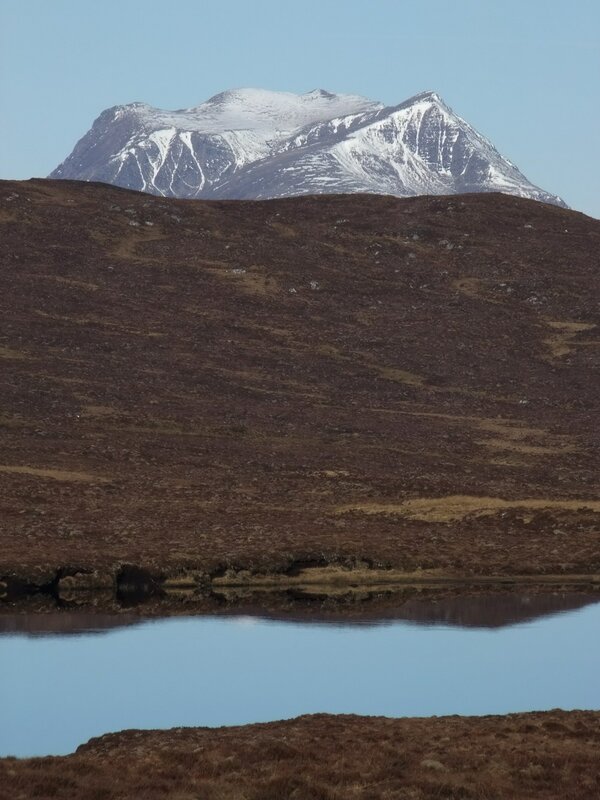 I had my sights on this modest hill since I saw it from Fionn Bheinn just over a year previously. I bought my bike as a means of approaching the hills more quickly, but now, using the bike adds greatly to the appeal of a hill. It makes for a more interesting and varied day. 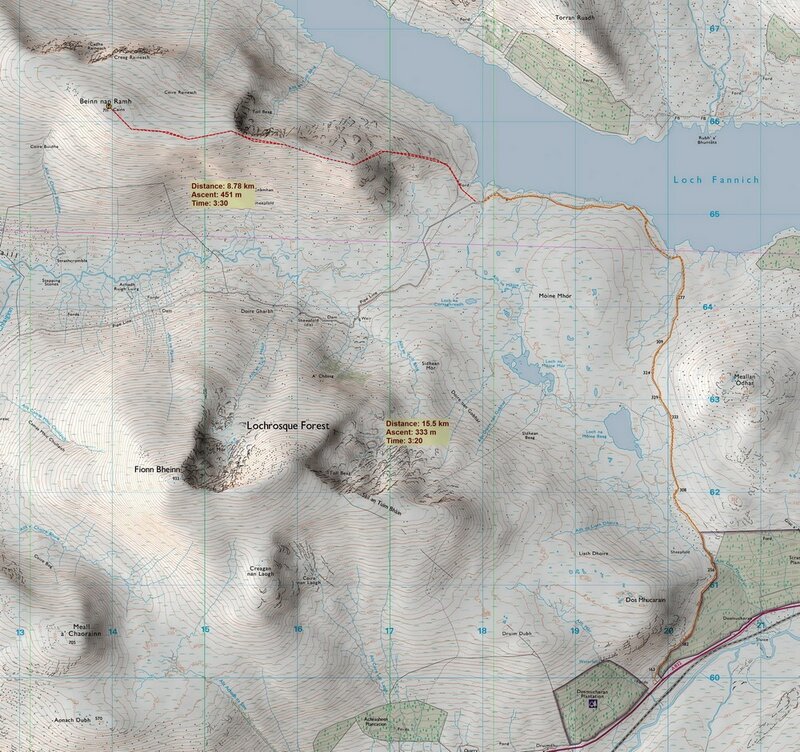 Beinn nan Ramh can be approached from Kinlochewe via Leckie, but I understand there are a lot of hydroelectric developments around the Heights of Kinlochewe, reducing the appeal of such an approach. 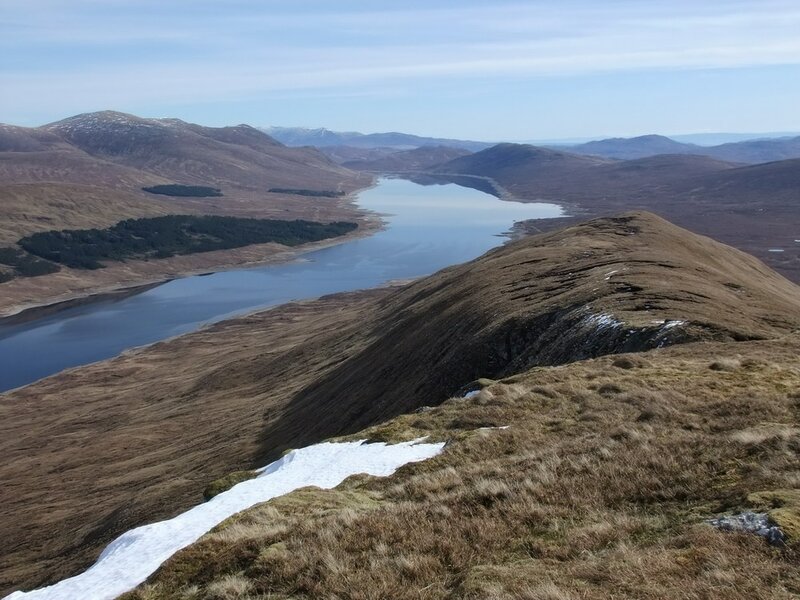 Furthermore, I would have needed to drive further, missed the best views across Loch Fannich and the east ridge to Toll Beag looked more appealing than the broad, lower gradient western slopes of Beinn nan Ramh. 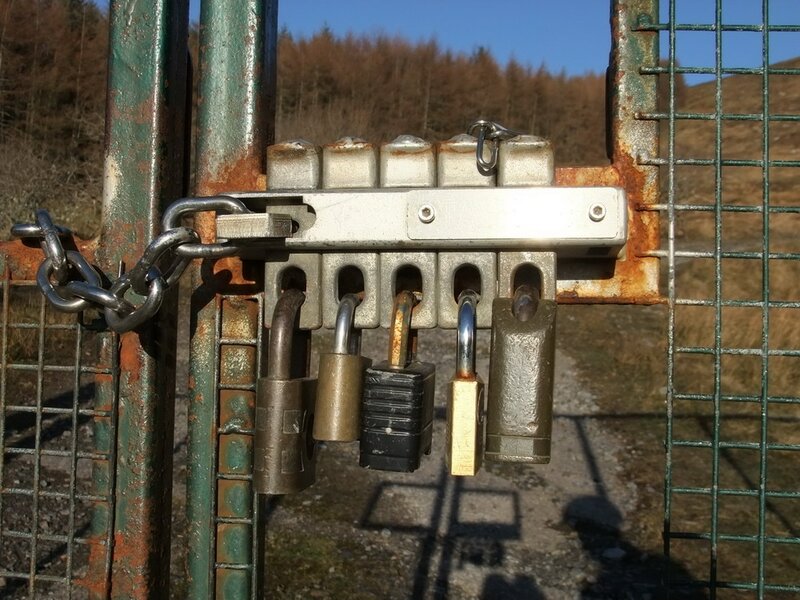 The route begins with a high gate, locked with five padlocks. 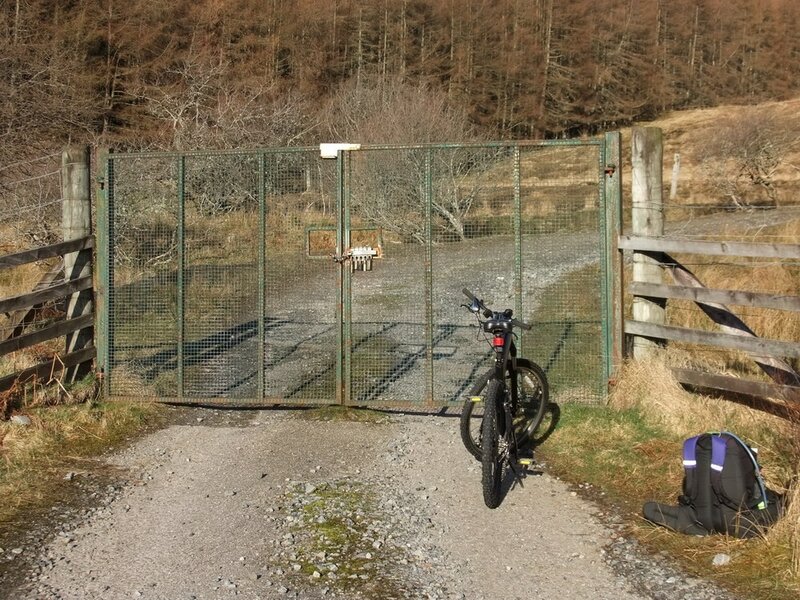 The mechanism is such that any one of five keys will open the gate but, as I did not have even one of the keys, I needed to lift my bike over the fence to the right. This proved to be easier on the outward journey as I could stand on the wooden fence but the return necessitated standing on the broken wire fence which sagged beneath my weight. 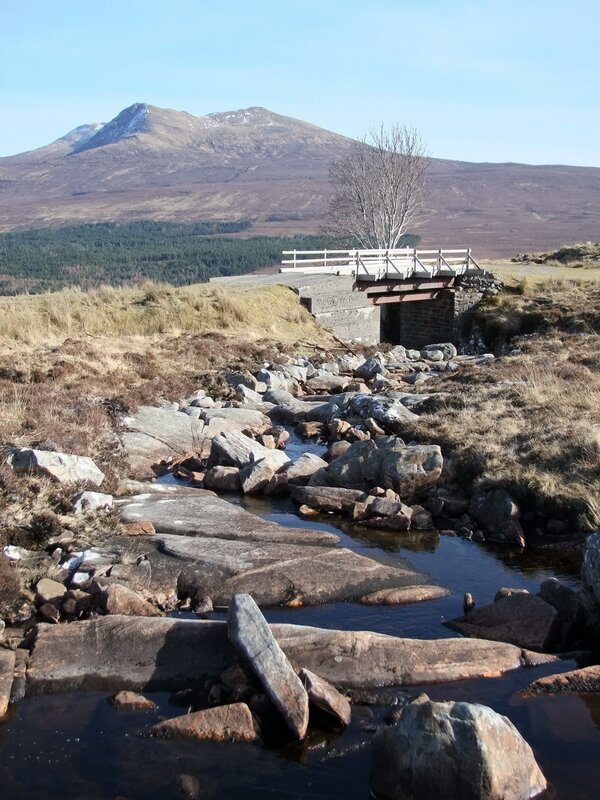 As I reached the highest point of the track, I saw Slioch, my favourite mountain. To the north, the Fannichs looked at their most splendid. 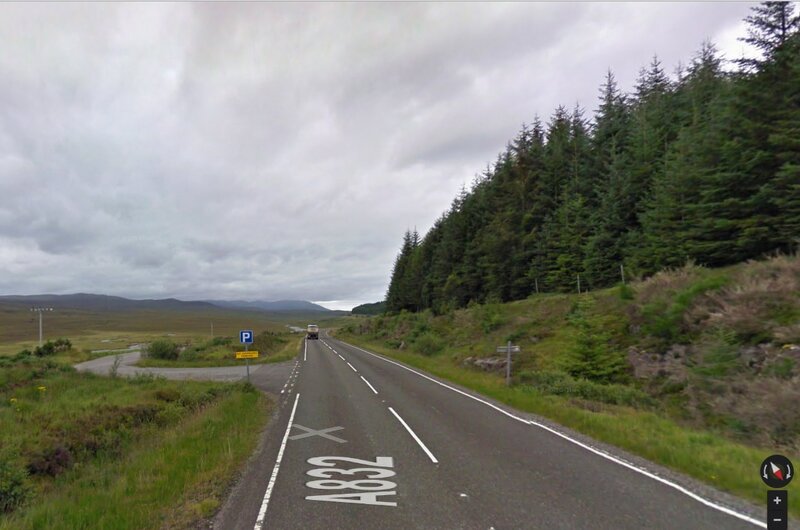 It is my intention to walk these hills from Lochluichart over three days (two nights camping). I had wanted to approach the eastern Fannichs from Lochluichart back in 1993. When I phoned the estate to inquire about any stalking, I received the reply, "Och well, it's best to stay off the hills altogether at this time of the year". As a result I did the eastern four Munros from the A835. I think it is time to put things right! For greater detail and readable names of the hills, click here. A right hand turn in the track took me to the base of the east ridge. Going was generally easy with just a bit of peat hag where the ridge levels out before Toll Beag. 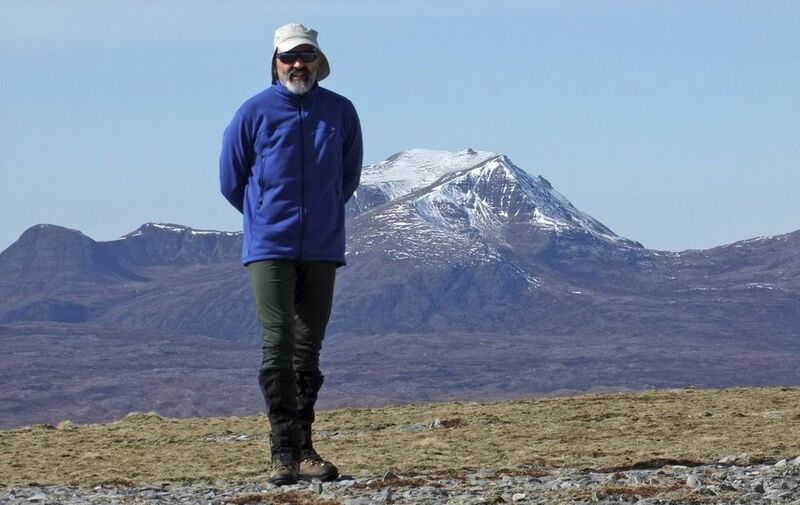 As I reached Toll Beag, my efforts were rewarded with a magnificent view of the Torridon mountains, especially Beinn Eighe. 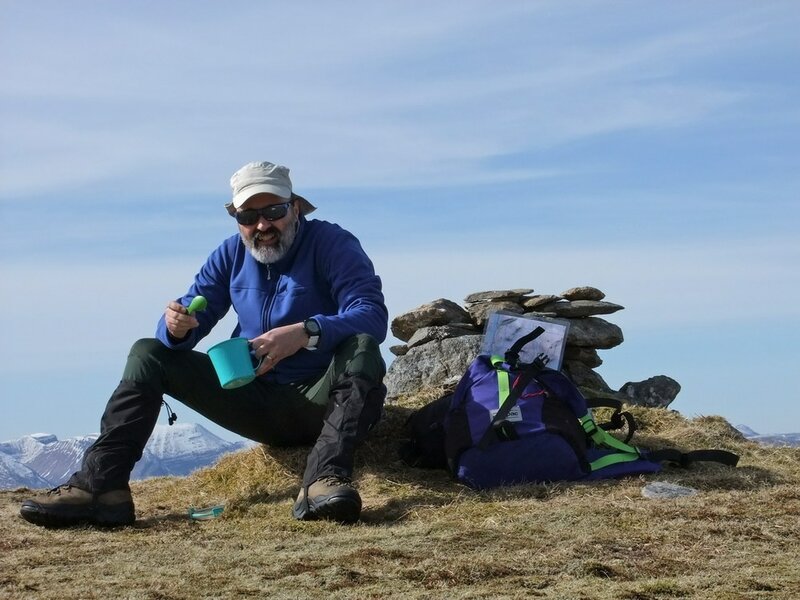 John West Tuna Salad on the summit - nice to be able to linger and savour the moment! With the clocks having gone forward, the sun was not setting until around 7.45pm so there was no great rush. I could afford to take my time, take lots of photos and enjoy the views, especially the Fannichs seen here. 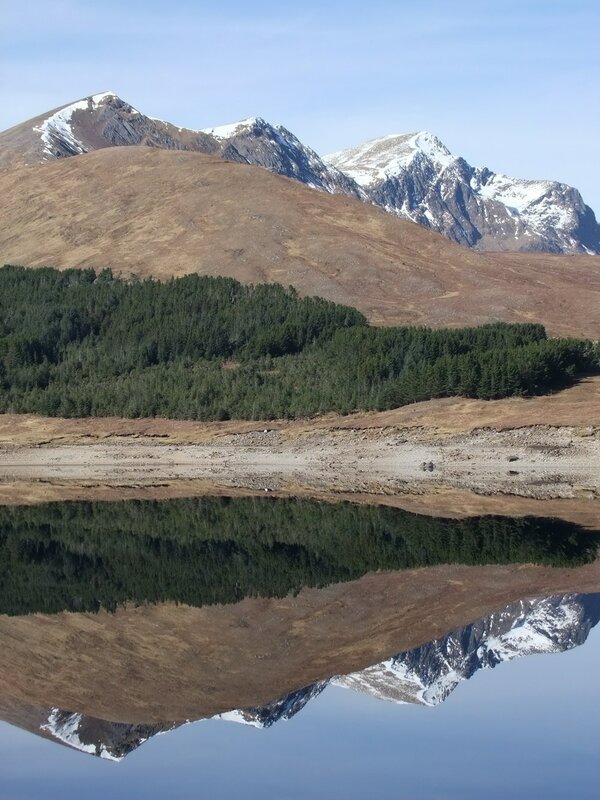 Sgurr nan Clach Geala (1093m) is the high peak to the left and the highest peak in the Fannichs, Sgurr Mor (1110m) is clearly seen to the right. 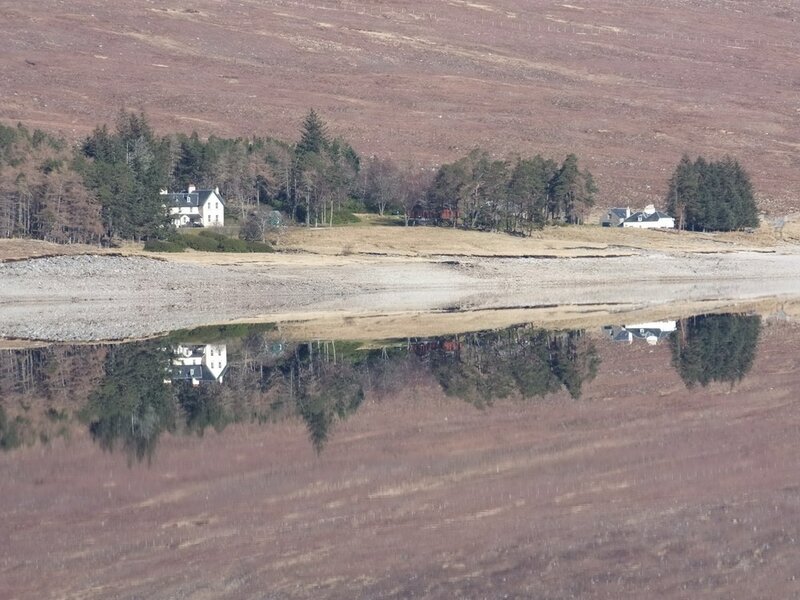 Reaching the shores of Loch Fannich, the water was still calm and mirror-like. Time to capture more reflections. Heading south back over to the car, I looked back at Beinn nan Ramh. I will always have wonderful memories of this hill; a pleasant route and fine views. It provided a reasonably challenging day but allowed me to relax and take it all in. The gradient down allowed me to gain some speed without the need to apply the brakes very much. I did take the time to stop and photograph Sgurr a' Mhuilinn/Meallan nan Uan. Back at the car, I still could not put my camera away. Not on a day like this!